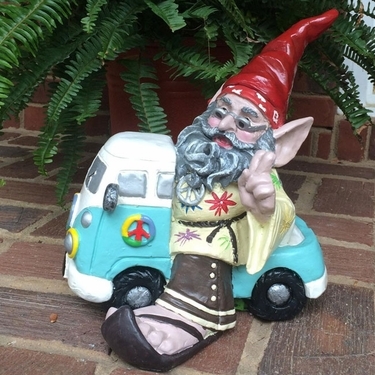 From our Premium collection, our Amazing New Hippie Garden Gnome Riding in a VW Bus is one of the nicest gnomes we've every carried. Incredible detail, this hippie figurine is a work of art for the most discriminating gnome collector. Flower jacket, bell bottoms, slippers, peace necklace, bandana, a VW peace mobile, and sporting the peace sign, this hippie gnome was born to ride and looks like he's heading directly to Woodstock!